Dakota County, Minnesota (USA) -- Watt Munisotaram, the biggest Cambodian Buddhist temple in the U.S., will celebrate its 29th anniversary Friday through Sunday, highlighted by inauguration of a Muchalinda (reflection) Pond on its southern Dakota County site. 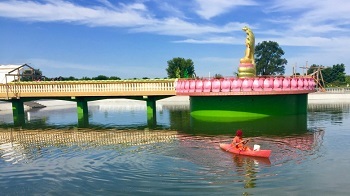 The 200-foot-by-175-foot pond, which has a 20-foot-tall Buddha statue in the middle, was built over the past two years by scores of volunteers. A ribbon-cutting ceremony is set for 9 a.m. Saturday. Chanda Sour, a member of Watt Munisotaram, said they anticipate the event will attract 3,000 to 4,000 people from across the world. After being founded in a small house in Eagan, the Minnesota Cambodian Buddhist Society purchased 40 acres off Minnesota 50 in Hampton in 1988. In 2002, construction began on a two-story, 10,000-square-foot temple, with funding from the Cambodian Buddhist Society and Buddhist communities in Minnesota and elsewhere in the U.S. The $1.59 million structure opened in July 2007. The campus includes the old temple (a clapboard house), which now serves as the year-round residence of monks and priests; an outdoor shrine; a stupa (a place of meditation where small relics of the Buddha and two of his disciples are housed); and the main temple, which has gathering and meditation halls. Live entertainment, traditional dance performances and food and beverage vendors will be part of this weekend’s events. For more details, including a schedule of activities, go to www.facebook.com/WattMunisotaramOfficial.